Preheat oven to approximately 190 degrees Celsius and grease a bundt cake tin with vegan butter. Combine milk and vinegar in a small jug and set aside. In a large bowl, sift together flour, sugar, cocoa and baking powder. Pour in milk, extract and egg mixture and chocolate and fold together until just combined. Pour into prepared tin, hitting lightly against the kitchen counter a few times to remove air bubbles. Place into the oven and cook for approximately 45 minutes, or until an inserted skewer comes out clean and the cake springs back when touched. Combine cherries, sugar, water, jam and kirsch into a small saucepan and cook over a low heat. Continue to cook until mixture is thick and sticky. Set aside to cool - do not put onto coconut cream until cooled! Remove liquid from the coconut tin and place the thick mixture into a bowl. Whip coconut cream in a stand of hand-held mixer until thick. It should resemble whipped cream. Cut cake into two halves across the middle. Pipe coconut cream onto the bottom part of the cake and top with cooled cherry mixture. Heat milk in a small bowl, add chocolate and whisk until smooth. 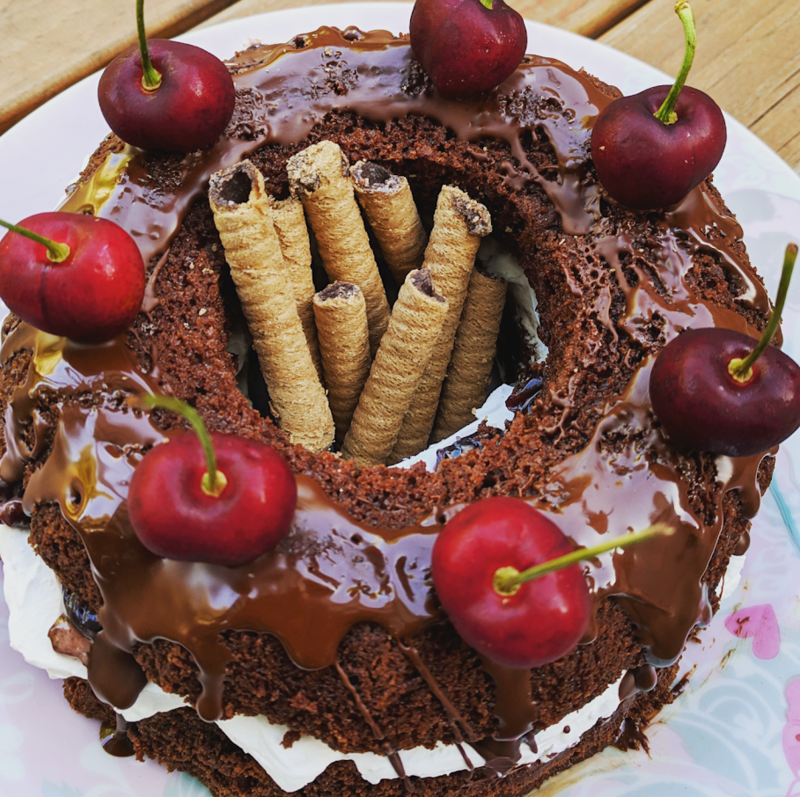 Drizzle over cake, top with cherries and wafers and serve!